The housing market is improving in America! The last quarter of 2013 showed vast improvements! If you're on the fence about buying a new home for your family, don't hesitate. The last thing you want to do is wait, and pay an extra 10% next year for the same house! 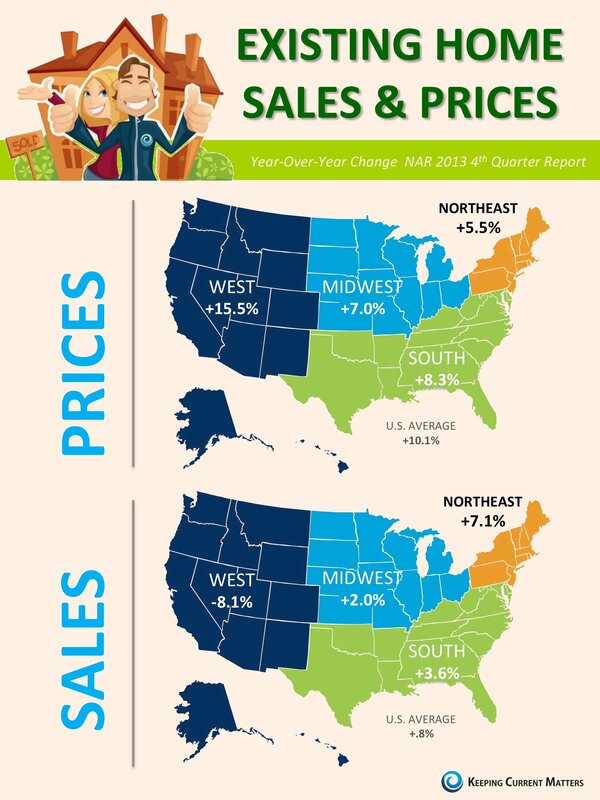 As you can see in this infographic from Keeping Current Matters, the entire United States is showing an increase in prices, over the previous year. Also worth mentioning is the fact that the western portion of the U.S. has seen a decrease in sales. To combat this, and reap the benefits of increased prices when selling your home, Just do your best to make sure you fix anything that's broken, paint any crazy-colored walls, stage your home to increase it's appeal, and renovate any rooms that are getting dated. It's worth spending $1,000 on your bathroom if it helps you sell your home quicker, and for closer to your asking price. If you've ever watched HGTV, you know that buyers are always looking for a "move-in-ready" home. Make yours their dream come true. It's time to upgrade to a better home, and ride the wave as markets all over the nation continue to improve after a horrible dip just a few years back. If you're really looking to save money, sell your home by owner on the MLS for a flat-fee. You can save thousands of dollars, and get the same tools real estate agents use! It's well worth the effort, and that extra money can be put to good use renovating your new home to further your profit! *This is not legal advice, just the opinion of one of our writers. If the market crashes, or selling your home wasn't a good choice, don't blame us!